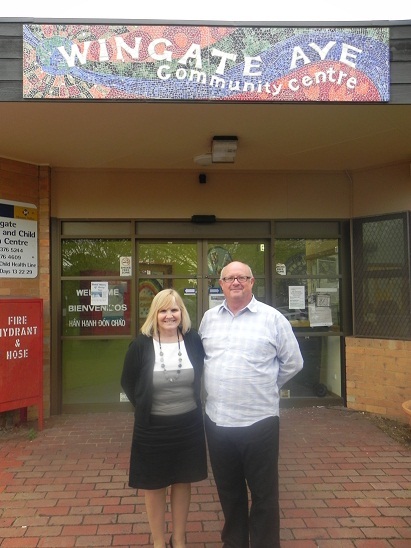 Managing a community house is like running a business, which Jan Thorpe discovered at the Wingate Avenue Community Centre in Ascot Vale. Thanks to her dynamic organisational skills and support from the centre’s Committee of Management, its future is bright. 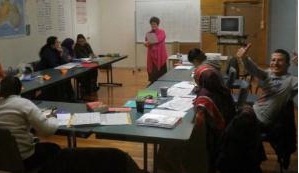 Wingate Avenue Community Centre teaches vocational and life skills to the local community and acts as a central hub for the surrounding, largely migrant community. It has served the Ascot Vale Ministry of Housing Estate since 1985, when a Committee of Management was established which included service providers, residents and local council officials. The Office of Housing provided the land and council, the venue, with the Housing Office agreeing to maintain the property. Many disadvantaged people live on the estate, including newly arrived migrants and refugees. It has an unemployment rate of almost 90 per cent, so the Community Centre has become an important support mechanism. It has also grown into an education provider and operates as a Registered Training Organisation. The Centre has 42 employees, including the Moonee Valley Legal Centre which Jan manages. Its co-located services include the Networker for the Western Region, ISIS drug and alcohol counselling, a New Hope Foundation settlement worker, an Anglicare financial counsellor and a Moonee Valley City Council maternal child health nurse. While the Centre is large and dynamic, Jan felt managing it was sometimes a lonely job. Jan had the support of a voluntary Committee of Management but she had to cope with constant change. “I felt I needed someone who I could ‘bounce ideas off’ and who could support me and give me some structure to my thoughts,” she says. When Jan received an email from Adult, Community and Further Education (ACFE) promoting its joint program with the SBMS, she thought she would give it a try and was matched with mentor Michael D’Arcy. Michael worked in a variety of National Australia Bank roles from 1971-2003, developing well rounded skills in marketing, business management and the machinations of the finance industry. His final role was Head of Business Financial Services, Melbourne South, where he was responsible for nine business banking centres. Jan saw Michael five times under the SBMS/ACFE program, and then enrolled for a second group of five sessions, which are continuing. Michael was impressed by what Jan had already achieved, and helped with a range of issues faced by the Centre including its growth and expansion into a diverse range of services. Issues they worked through included sourcing and managing outside service providers using Wingate’s resources, staffing restructure, individual staffing issues, Jan’s relationship with the Committee of Management and pricing decisions. “I have assisted Jan to manage the Centre through some serious ‘growing pains’,” Michael says. Michael also helped Jan through the process of negotiating terms for an outside group to use the centre’s commercial kitchen, which provided a template for similar deals in the future. “What it did was set up a model for her … that was good for Wingate and good for the supplier,” he says. Jan now feels she is ready to tackle staff issues “head on” and be more confident in her decision making processes. “For the first time in 10 years, I feel I have someone to support me instead of me always supporting everyone else.” she says. Jan is extremely grateful to Michael for his help and advice. “Without seeking help from the SBMS, I would not have been able to gain the confidence I needed to make informed decisions, to take a step back and look at the Centre’s finances and see where we could increase our revenue and cut programs that were not financially viable,” she says. “It was a fresh person to look at the service we were offering. Our SBMS person helped me to work with the Committee and ask for increased wages and conditions for Centre staff and value what I bring to the organisation. Michael says the Centre is definitely moving in the right direction, largely due to Jan’s hard work and good management. He says mentoring helped her realise she was on the right track.